The case study of total owning cost of compressors is derived from the techno-commercial offers of the three compressor-OEMs given to a North Indian textile spinning mill’s compressors requirement project in 2016. The case study of total owning cost of compressors is derived from the techno-commercial offers of the three compressor-OEMs given to a North Indian textile spinning mill’s compressors requirement project in 2016. The mill was planning to replace and upgrade their existing BOP type reciprocating compressors with energy efficient screw compressors system for their 750 CFM compressed air requirement. This consists of compressor housekeeping, compressor daily condition monitoring and running cost of the compressor as a package including its utilities like dryer, wet and dry air receivers etc. This includes the air intake and pipeline filters along with their Delta P indictors, before and after the dryer. But the industry needs to insist the energy of the compressor and compressed air treatment, in terms of pressure, temperature and flow parameters monitoring of the above sub systems to be the part of TOC. Why Not Two Compressors Only Instead of Three Now? The plant requirement is 750 CFM at current header working pressure of 6.5 Bar and so the OEMs have given their compressors at 7, 7.5 and 8 Bar ratings. The plant can decide to go for 2 number compressors, instead of 3 number to meet the demand. Compressor of higher KW ratings consumes less input Watt per CFM output compared to the compressor of lower KW ratings. So, the user has to study his load pattern and cycle and decide on two compressors only are needed and what is the need to go for the third compressor now, he has to decide prior before getting the offers. See the SEC offered by the three OEMs in the comparison table, lower KW compressors give marginally higher 5 per cent SEC and the user industry to thrust on improving the overall SEC of whole system. Whatever the OEMs give the SEC here in their offer, the same SEC must be proved by the same OEMs during the commissioning and to be recorded in their commissioning report to the user. Why they need three compressors for trouble-free workings? User industry with a distant vision and looking for trouble-free maintenance can think of one more compressor as active spare and rotate the duty workings of the three compressors as main and standby. The user must always keep in mind that, what will happen if one of the compressors breaks down for few hours or days, the industry has to stop because of this breakdown. Maintenance crew will be in tension to keep the two active compressors always healthy and they can’t afford to have a breakdown of existing compressor even for few hours. This 750 CFM demand can achieve with one compressor of 75 KW & one of 55 KW (instead of two numbers of 75 KW as offered by OEM) rated compressors is suggested to OEM A. But here, OEM to recommend to use one 75 KW machine as base load and operate the same to its 80 per cent of rated motor KW capacity and modulate the other 75 KW compressor at around 50 per cent loading. machine is offered by the OEM as 2.66 is very low as 2.66 CFM only per KW, when the first machine’s SEC is offered by OEM at 6.09. This wide variation in SEC as offered in the comparison table can’t be tolerated. Out of the three compressors, offered, the VFD can be fixed to lower KW rated compressor only and not to higher KW machine as offered by OEM. 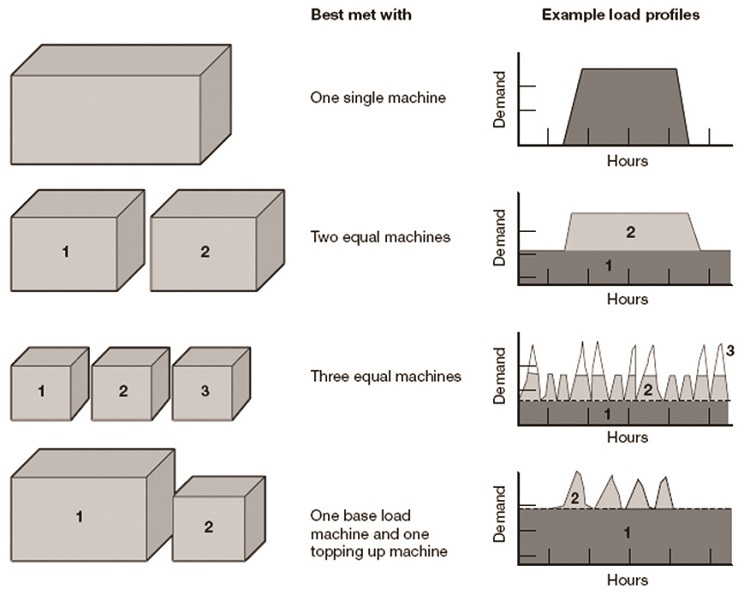 The industry must keep in mind to use the VFD effectively in the mid-loading region, here in compressors usage in the “load: unload cycle” is around 50 per cent loading ± 20 per cent band. If the same VFD is used at 80:20 load / unload cycle, then VFD becomes ineffective and added to it, its self consumption reduces the scope of energy savings in that region. So, VFD has its limitation to use through entire load cycle. Here, the user has to improvise the pressure settings of base load and modulating compressor to achieve energy savings. The VFD machine is rated at 13 Bar. This is ok for a stand-alone machine but for multiple compressors system, this 13 Bar rating is a mismatch; to say VFD compatibility can be achieved on 13 Bar rated machine. On the contrary, focus on the industry’s requirement of 6.5 Bar pressure and what is the point in giving a 13 Bar machine and forcing the user to necessarily make use of the VFD working on the machine? VFD to a screw compressor will be mismatched and the user has to tune the VFD compressor to use in its efficient loading zone. Here, instead of energy saving, the user has to take care to efficiently use the VFD. So, first monitor to target reduce loading related energy losses. The user industry, if at all they have oversized compressors, then to fine-tune the pressure and reduce energy losses first, and later they have to utilize the VFD to function in closed loop control. The existing industry needs to follow the BEE mantra of monitoring energy to target its reduction. They have to first buy and install compressed air header flow meter to measure the existing or proposed compressed air flow is at 750 cfm. After installing and studying the existing compressed air generation parameters and confirm they can match to the load. 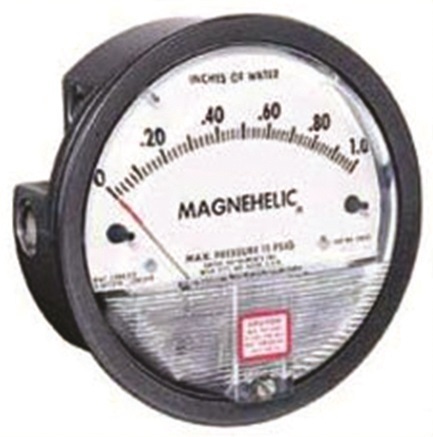 If it is new project, this flow meter needs to be part of part of project package. 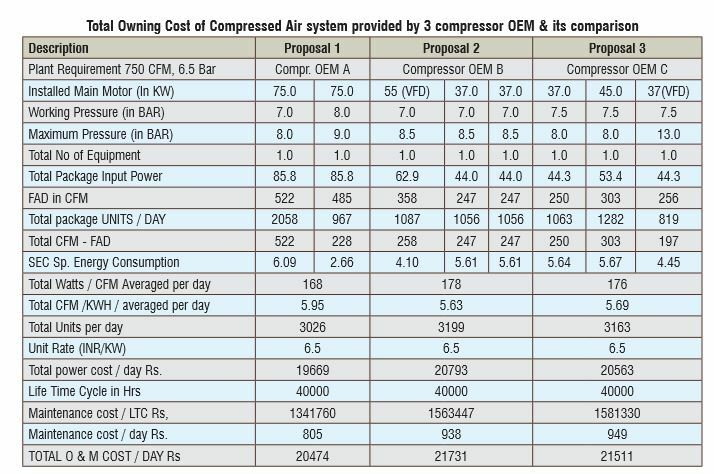 User is paying electricity charges of Rs 1 crore PA for the compressed air per year and that the compressed air parameter is a fastacting variable, need to be measured quickly to monitor the generation, distribution and usage efficiency and the losses happening in between. Each screw compressor panel must have multi-function energy meter to show instant power and energy parameters and cumulative kwh for load hours and unload hours. This will show relative energy efficiency of each compressor compared to others. And overall compressor house KWH/KVAH parameters to be compared with total CFM to study the WATT PER CFM at 6.5 Bar daily, weekly, monthly and yearly. First, the OEM in their offer has to include FAD study at site as part of their commissioning report. Then compressed air leakage needs to be measured by pump-up capacity procedure, or by the above compressed air flow metering method, routinely. First, let the industry arrest and confirm that the compressed air leakages are minimum and within the norms of industry segment. Compressed air leakages are different, as per the industry segment wise. Say the air leakage in spinning mill normally is around 20 per cent Band. But in textile air jet looms, normally it is around 5 per cent plus only as per that segment norms. So, know your leakages first and arresting them is immediate need of the hour now. The compressor’s input is only this ambient air at the intake, this must freely deliver at inlet. If the filters are choked, then this air has to force itself through choked air intake filter to deliver to compressor inlet. 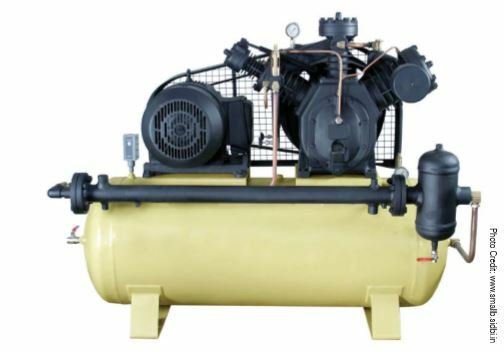 The air compressor vendors have given instructions to the user to change the air intake filter after few thousand hours and accordingly the industry is implementing this replacement. Why should allow air intake filter to choke till 3000 hours and take action later. Every day and every shift, clean pre-filter online. Instead of allowing the choke up to 500 mmWC across filter after 3000 hours, routine cleaning of pre-filters will allow you to maintain and sustain at say 100 mmWC pressure drop across your filter. This will improve and sustain compressor FAD. 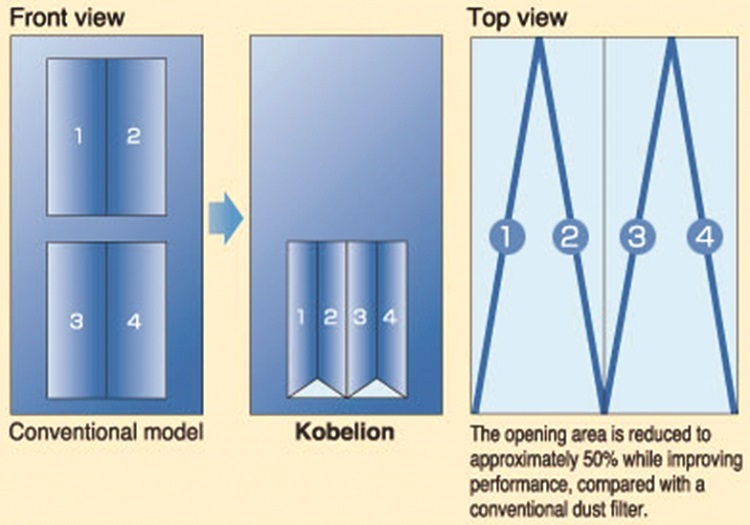 If the same industry condition monitors the air intake daily, then keep swapping the cleaned filter weekly, the industry will see to it that the air intake pressure drop is very minimal. 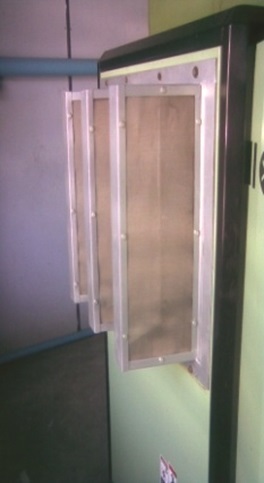 We need three stage filtration of air intake air, daily cleanable V type filter, weekly cleanable one-inch depth thick mesh filter embedded on the hood, and next is the real air intake paper filter fitted on compressor mouth suction. The Magnehelic Delta P gauge to measure Air intake filter Delta P to fix on hood, to be monitored daily and keep Pascals minimum. It is suggested to the OEMs to recommend to the user to relocate the compressor’s discharge pressure sensor from the hood to the air receiver. This will reduce the pulsations of the compressor load and unload pattern, give steady compressed air header pressure and improves safety of compressor working, thus leading to energy savings. The industry which runs on single or multiple air compressors in the compressor utility house can implement this sensor relocation to main receiver to maintain a narrower band, but constant air header pressure. 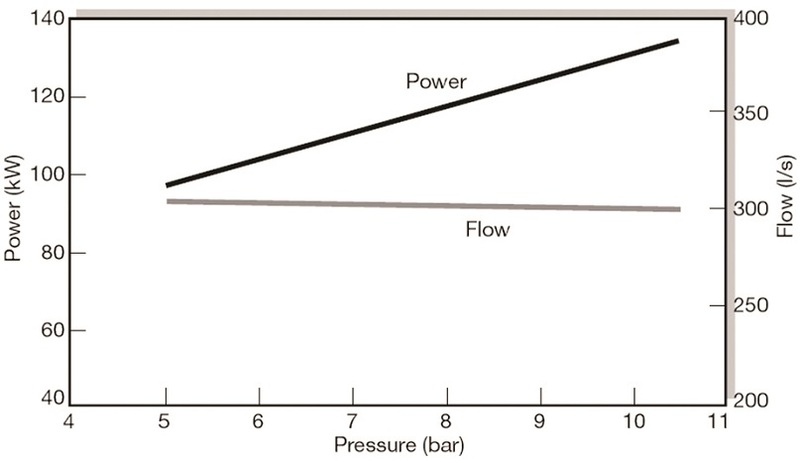 First the industry, when floating an enquiry to the compressor OEMs, must say the flow and pressure criteria that it needs 750 CFM at 6.5 Bar as operating pressure. To check with the relevant equipment OEM what is the compressed air demanded in CFM and Bar minimum, average and maximum values. Here, the user has to reverse-educate the machine OEM that they have to reduce their minimum CA pressure demanded from header. During audit, I came across 1000 CFM header air flow at 7.5 Bar. 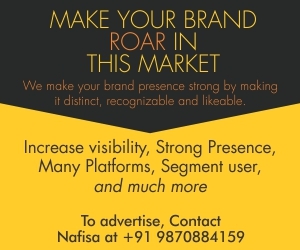 Here, the user industry maintained 7.5 Bar to cater to few machines of 100 CFM requirement only which required 7 Bar. And 900 CFM out of 1000 CFM air flow is needed at 6 Bar loads only. So, for 100 CFM @ 7 Bar, I had suggested the user to go for pressure booster and after that, user industry saved one lakh units per annum. Also, I suggested to that industry to discuss with their machine OEM to reduce its demand for CA pressure from 7 Bar to 6 Bar by upgrading of pneumatic components inside his machine to bring to 6 Bar as minimum requirement instead of 7 Bar now. contract out Air Leakage Detection & Correction routinely, at least now. Wet and dry air receivers are mandatory need in compressor and its compressed air treatment system. The compressed air generation cost goes up to 5 per cent due to poor performance of water separators, excess pressure drops across the filters, added to this is the artificial pressure cyclic load unload fluctuations. Allow each of the compressed air treatment sub system to stand alone, breathe well and with a buffer in between in them through the two receivers. For which, after the compressor, the WS + AO filter in the pipeline at location, between the compressor and air receiver can be shifted at location, between air receiver and dryer. 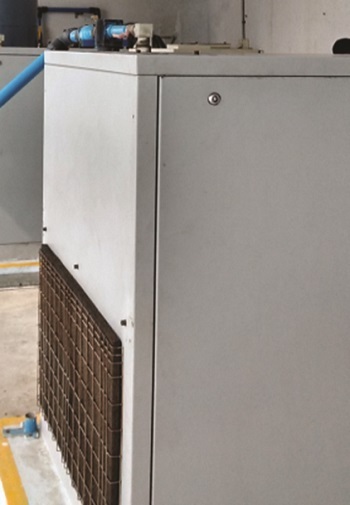 In a multiple compressor system, even when only compressor is running, user to make parallel running of all individual receiver and dryers and filters so as to bring down pressure drops inside compressor house and allow more receiver volume to cool air. Digitalise the compressor house final air receiver air pressure and temperature along with high or low alarm settings. If there is generation air flow down or process demand high or heavy leakage somewhere inside, this will show with low pressure alarm. Instead of allowing the machines to shut down due to low air pressure, we can step in prior to correct the low air pressure. The air receiver temperature with high alarm will show the compressor and its post air cooler heat exchanger healthiness. The above alarms are intended to improve the compressor house-keeping and not to trip system. If the user thinks compressed air is precious, he must talk in terms of two decimals like 6.54 Bar as pressure and not with one decimal alone. After studying the total owning cost of the three OEMs, we understand that the offers can still be, more practical on the TOC, i.e. the running cost. The OEMs have to standardise on the add-ons to their offered systems as like two air receivers, VFD, delta pressure gauges across the line filters, refrigeration dryer of 50 per cent more capacity, one more active spare compressor system (optionally, so as to smooth and timely preventive maintenance on the rested compressor) etc. It is suggested here to the compressor OEM to give a matched set of compressor & its air treatment devices to the user, and not to compromise on those device parameters, by retaining the compressor cost and reducing the cost of peripherals to clinch the order. Here, the user also needs to proactively discuss with the compressor OEM during the offer stage, to allow him to give his professional supply & services, as a complete system. Trying to cut down the initial budget, the user & OEM compromise there on the compressed air treatment. This leads to sustainable energy loss of more than 10 % over the compressor’s life. This is typically explained in the above comparison statement of the three compressor OEMs. So, this is to insist on TOC of compressor system, for which the user and the OEM have to be collectively responsible & pro-actively work towards sustainability.